Photobooths are a really big deal right now, maybe they are a trend but I don’t see them leaving anytime soon! Last week I was in charge of Red Ribbon Week at the school. We decided instead of spending money on little prizes for all the kids (think Smarties and glow sticks) like they had in the past, we would blow our budget on a photobooth. Turns out renting a photobooth for 2 hours cost more than we had in our budget! So I started researching how we could do it on our own, turns out it was really simple! I didn’t plan on doing a post, so I don’t have many photos of our set up, but I couldn’t believe how many time I’ve been asked how we did. 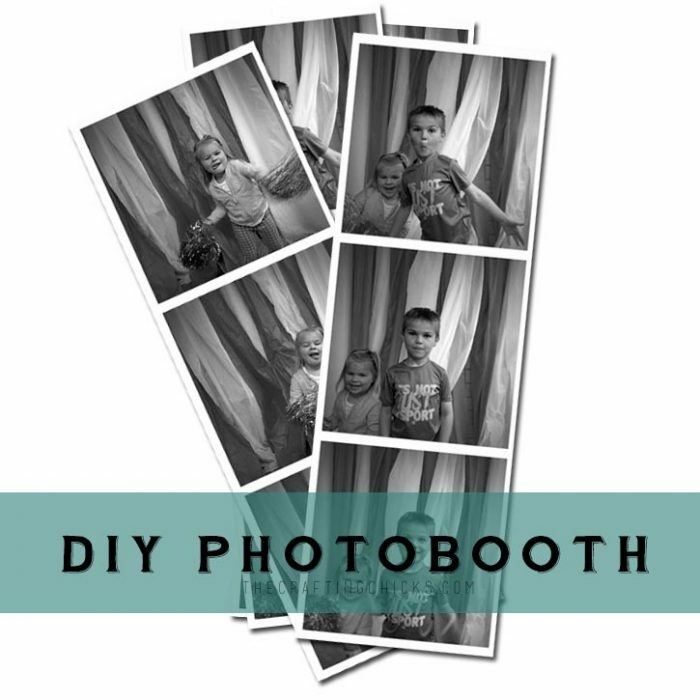 So I’m thinking there are others out there interested in a DIY photobooth! Because I already had some of the big ticket items we spent about $120 – including the printing of photos for 600 kids. Ready to see how it all works? 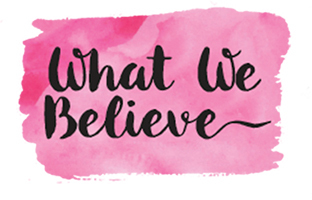 This is not a sponsored post, but I have included affiliate links for your convenience. I know some of you are going to ask about other tablets, and I would assume there are similar apps available but I haven’t looked. Here is the only photo I snapped of our setup at the school. We used red and white plastic tablecloths from the dollar store for our backdrop, but you can get fairly inexpensive photobackdrops off Amazon. You can see the tripod and iPad mini. The quick release feature of the tripod was great, because we had the photobooth going before school, during lunch and after school so I could quickly release it and take the iPad with me. 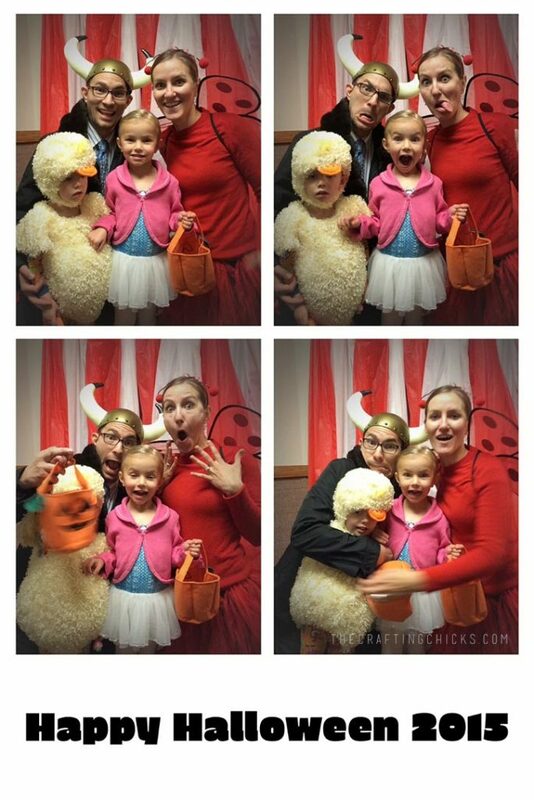 The Pocketbooth Party App is the main key that makes this whole setup work. It let’s the photo takers see themselves and automatically sends the photos to the printer. Making the whole photobooth experience very user friendly and automatic. It costs $39.99. 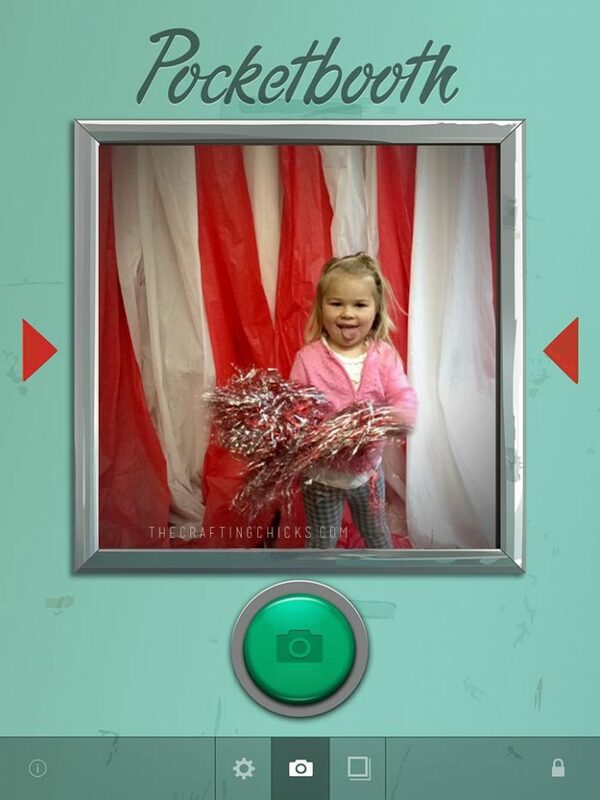 There is also a $0.99 version called Pocketbooth, but after researching both it seemed that Pocketbooth Party would be better for the large group we were working with. 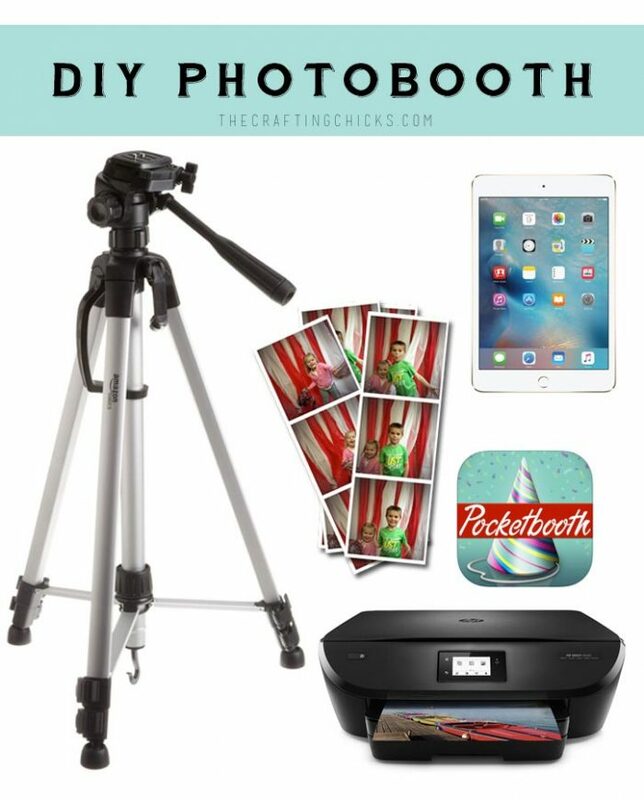 Pocketbooth Party gives you a lot of options, so you can find something that works perfect for your group. 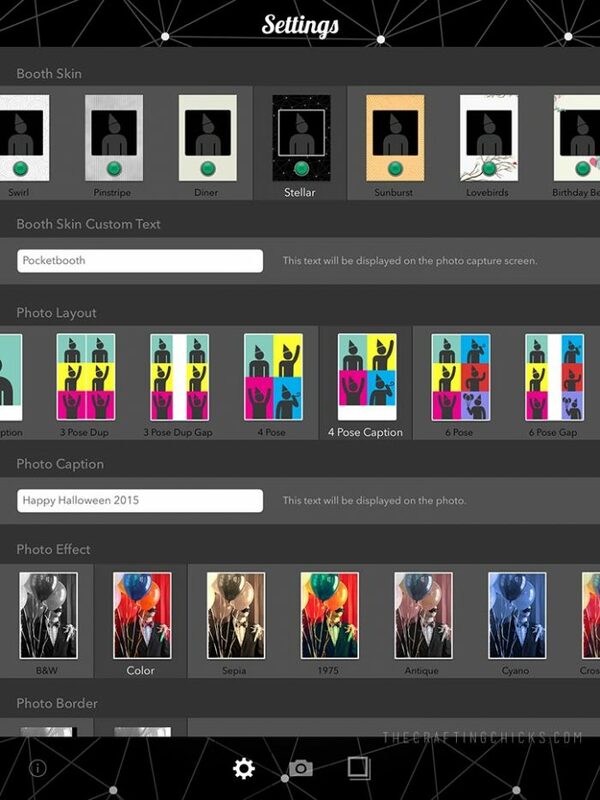 You can choose the number of poses, the arrangement on the sheet, if you want a caption and even different photo effects. It also let’s you choose if you want to save the photos, send them straight to the printer, or save and print them. The app requires a wireless printer connected to the same network as the iPad to be able to print wirelessly. Which sounds more complicated than it really is. I already had the wireless HP Envy printer so as soon as the kids were done with their poses the printer would automatically start printing. It prints on 4×6 photo paper. At the school we had it take 6 different poses so we cut them apart so everyone kid was able to have a photo. Some of the kids complained that it took so long to print, and I would laugh because obviously they don’t remember the photobooths that had to develop the film before you could get your pictures! It doesn’t matter which model of iPad you use or if you use a full size or iPad mini, but be aware that the app uses the front camera which is much better in newer iPads than older. The setup worked so well I moved it to the church for our congregations Halloween Carnival later in the week. I do HP’s subscription ink, so it only cost me $10 in ink! HP has a tiered system that let’s you choose how many prints you want and they charge you accordingly. They also mail you new ink cartridges when it senses you are getting low, so I never have to go to the store and never run out of ink! I am seriously the biggest fan of it. My printer cost around $50, and for the amount of printing I do it has saved me so much money. (We’re not affiliated with them (I wish though!) but it’s really great!) For a photo booth I would highly recommend the subscription ink + having a new cartridge on hand just in case. This is awesome! Approximately how long did it take to print? It varied. The bigger the backlog the it seemed to take the printer. So the first one is only about 30 seconds, but by the time there are 15 waiting in the que it was probably over a minute. That doesn’t seem bad at all! Do you know how many megapixels your i pad has or even what generation your i pad is? Can you print strips like photos? I wasn’t able to find photo paper in strips and I’m not sure my printer would be able to print that narrow, but you could cut the 4×6 paper into 2×6 after it prints. So, did the ipad automatically take the pictures when someone came to the phone booth or did you have to have a person taking the pictures? You can either have someone push the button or have the person being photographed push it. There’s a button in the app to start the photo process. I believe you can set how many seconds between photos. Were you able to add a logo or choose the border when you printed the pictures? I looked for the apps “pocket booth” and “pocket booth party” but couldn’t find them. Are they still available in the app store? Hmmm…I just searched and found them both. Try Pocketbooth all together/without the space. Love this project! Did you have a wifi connection? We are holding a dog photo contest and won’t have access to wifi. We did use wifi, but I’m wondering if the printer and iPad could work on Bluetooth. I’ve never tried it, but it might be worth looking into. Were you able to save the photos to be printed later? We are wanting to print pictures for our guests at our wedding but we want copies of the photos being taken so we can print them later and add to our photo album. Great idea!!! Thanks for sharing! The app does give you the option to save the photos. This is so great. We are thinking of doing this at our Halloween party. What color backdrop did you use? We were going to use black, but that’s a whole lot of black ink we will go thru, don’t you think? Also, we want to see the people in the pictures from head to toe, since they will be coming in costume. any suggestions as to backdrop. Is there a remote photo shutter thing we can buy. Thank you. Ooh a remote would be awesome! I did a quick search and found this one https://www.apple.com/shop/product/HHZY2ZM/A/hisy-selfie-camera-remote but I’ve never used it. 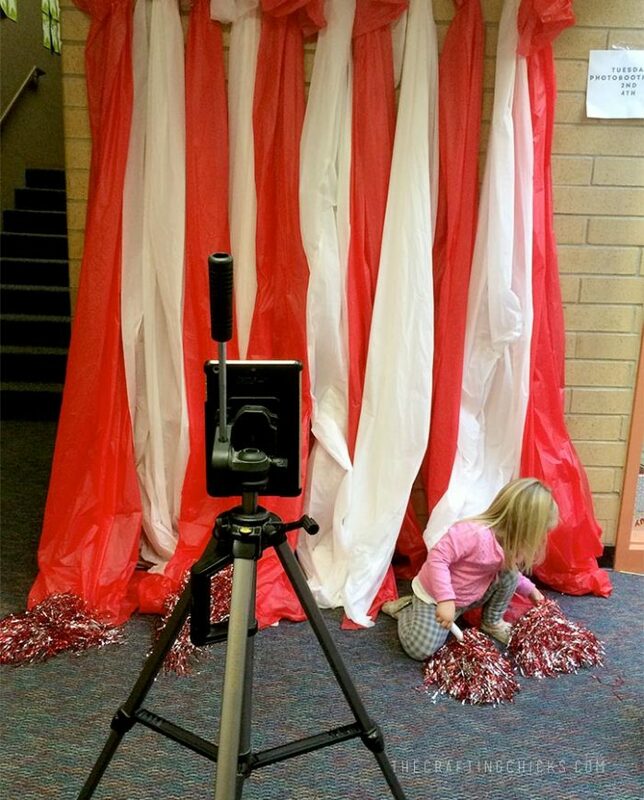 Our back drop was red and white for Red Ribbon Week. I would recommend a lighter backdrop just so you can see more details on the people and costumes in the photos. Oriental Trading has a lot of photo backdrops, you might want to check there. Have fun! Thank you! How did you get people to look at the camera and not the screen? Hi, I’m looking at doing a Photo Booth for my church’s easter egg hunt. Does this allow you to email the photos to yourself directly from the iPad? also does it allow you to store emails that were sent from the app (for future church marketing)? You can email, but I’m not sure if it let’s you save email addresses. Looks very doable. Did you use a remote control for the camera/ipad? It’s so doable! I didn’t use a remote – there has always been someone more than willing to hang out and press the button but a remote would be good.